When I left this morning, there was maybe a couple inches of snow on the ground. It took me a few minutes to clean off my car, and I was on my way. I spent the day in Grand Rapids, which is about 30 miles from where we live. There was hardly any snow there. But on the way home, the weather changed… At some points during my drive, I couldn’t see the car in front of me because the snow was blowing so much. Then this is what I came home to! Snow! UP TO MY KNEES!!! 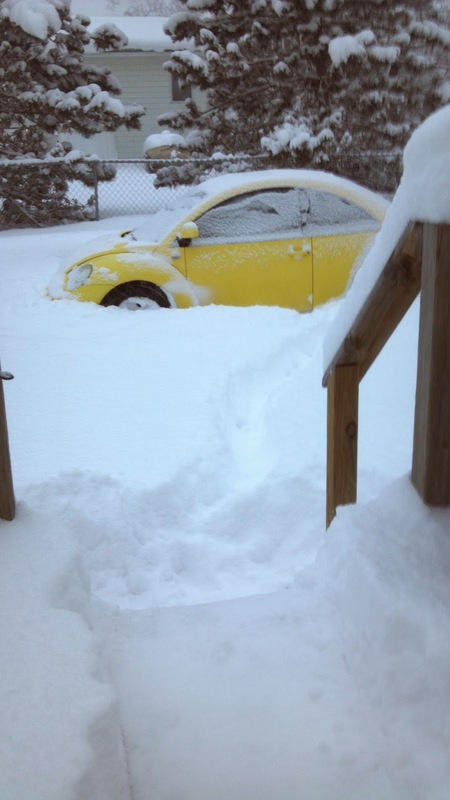 My little Beetle, which only has 6 inches of clearance off the ground, had to plow through the snow in order to get into our driveway. As you can see, the snow is VERY deep, almost up to my headlights. So… I guess, I’m not going anywhere else for a while. One year in our house! Lots of before and after pictures!